U.S. Sen. Rob Portman (R-Ohio), left, chats with State Sen. Bob Peterson (R-Washington Court House), center, and State Rep. Shane Wilkin (R-Hillsboro), right, inside Building F at the Wilmington Air Park. WILMINGTON — With renovations and building demolitions already taking place to make way for an Amazon air gateway at the Wilmington Air Park, U.S. Sen. Rob Portman (R-Ohio) met there Monday with Amazon leadership and the general contractor HGC Construction out of Cincinnati. Over the next few months, 300 or 400 construction workers will be on-site, Portman said, “so it’s already helping the community.” He added that though the majority of the commercial construction jobs needed for the renovation work will not be local, the majority of those workers are regional. Clinton County Port Authority Executive Director Dan Evers said Monday as part of the entire project, Buildings B and C are being demolished to accommodate additional parking, truck and trailer movements, and the flow of product into and out of Building F.
And Building F, which is a spacious, two-story sorting facility at the air park, is itself undergoing renovation as a portion of the upgrade for the Amazon project, said Evers. Some of that renovation includes upgrading the building’s docks, some structural modifications to the building, and renovating the restrooms. Plans call for a number of employee break rooms. After taking a tour of Building F, Portman said he has a lot of confidence Amazon is going to like the Wilmington site. The size of the runway and a lack of congestion with other airlines make the Wilmington Air Park very attractive, he said. It is also near a number of Amazon fulfillment centers in Ohio, which includes two big ones in central Ohio and a new commitment to build one in Monroe in southwest Ohio, said the U.S. senator. “I think they’re going to find that this is a good place for them. And I think they’re going to find a really good workforce here, and my hope is they’ll expand even further,” said Portman. State Sen. Bob Peterson (R-Washington Court House), who represents Clinton County and other counties in Columbus, was part of the group present Monday at the air park. Peterson said he is very excited with Amazon’s Nov. 12 announcement about an air gateway in Wilmington. “This is a great facility, and certainly Amazon’s growth and business model fits perfectly with the people, work ethic, and this facility,” said the state senator. Amazon Air currently operates out of more than 20 airports across the United States, with Wilmington forecast to open around mid-summer next year. The new operation will include daily flights, and an on-site facility to sort packages bound for their next destination. While there was no hard number released either Nov. 12 or on Monday as to the number of start-up jobs for the Amazon air gateway operations here, Evers on Nov. 12 said he anticipates more than 300 new positions at the air park. Last month, Amazon announced it would raise the minimum wage for all of its U.S. employees to $15, effective this month. Reach Gary Huffenberger at 937-556-5768.
https://www.recordherald.com/wp-content/uploads/sites/27/2018/11/web1_state_legs.jpgU.S. Sen. 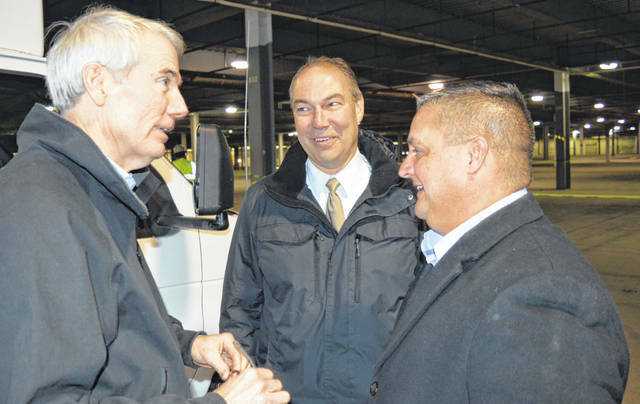 Rob Portman (R-Ohio), left, chats with State Sen. Bob Peterson (R-Washington Court House), center, and State Rep. Shane Wilkin (R-Hillsboro), right, inside Building F at the Wilmington Air Park.